The Compact Muon Solenoid (CMS) experiment on the Large Hadronic Collider (LHC) is currently under construction at CERN in Geneva, Switzerland. The LHC will be the highest energy collider in the world upon its completion in 2008, colliding two proton beams at a center-of-mass energy of 14 TeV. 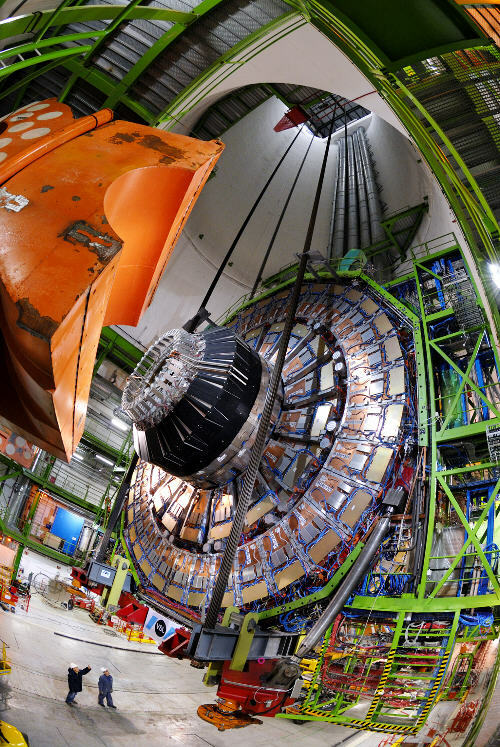 The LHC provides excellent opportunities to discover the Higgs boson, a key prediction of the Standard Model that will lead to fundamental understanding of the origin of mass. The new energy realm opened up by the LHC could also yield unexpected discoveries, paving the way toward our understanding of particle physics beyond the Standard Model. This Ohio State group played a major role in the construction of the Endcap Muon system for CMS. Over 200,000 channels of readout electronics for the endcap muon chambers have been designed and built at Ohio State. This construction project was funded jointly by DOE and NSF at a cost of over 7 million dollars. With the active area of all CMS Endcap Muon chambers slightly larger than a football field, the system can locate and measure the position of any passing muon to an accuracy of 100 microns. This level of accuracy is necessary to achieve the required momentum resolution of muon tracks bending in the endcap magnetic field. The muon signals read out and measured by Ohio State electronics will be crucial in searching for the Higgs particle. The photograph shown above was displayed on the cover of Science Magazine (March 2007). It shows a portion of the CMS detector, a 1200 metric ton endcap muon disk, being lowered into the experimental hall 100 meters below the surface. In the picture, 72 of the 468 muon chambers are visible as the copper colored trapezoidal boxes. The Ohio State electronics are mounted within electrostatic shielding on the large end of each chamber. The blue cables pictured carry the electronics signals to the data acquisition system.